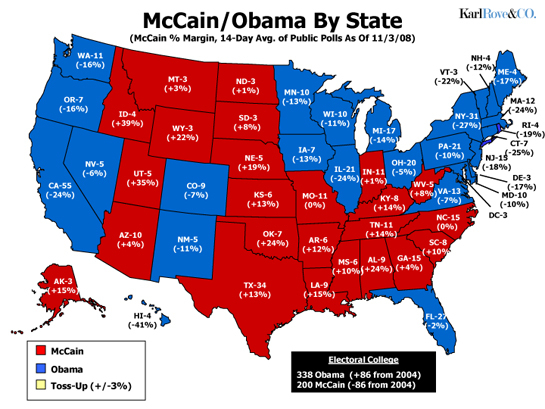 The final Rove & Co. electoral map of the 2008 election cycle points to a 338-200 Barack Obama electoral vote victory over John McCain tomorrow, the largest electoral margin since 1996. All remaining toss-up states have been allocated to the candidate leading in them, with Florida (27 EV) going to Obama, and Indiana (11 EV), Missouri (11 EV), North Carolina (15 EV), and North Dakota (3 EV) going to McCain. Read more election predictions here and on the ground reports here.